While touring with Lebanese band, The Wanton Bishops, musician Salim Naffah began to write songs that ultimately turned into his first solo album, released under his artist name Alko B. The 24 year old is best known as one half of the local indie band Loopstache and as the former bassist and guitarist of the Bishops. It’s safe to say that he’s one of the most promising musical talents in Lebanon today. He also wanted to include the word “tape” in the album title because he likes the word and the object, to the point that the album was actually recorded on an old fashioned analog tape recorder, retaining the sonic flaws of the old-school technique. Aside from experimenting on the machine, Naffah points out that making the album was also “a process to understand how I function. By the end of it I was writing music and lyrics a lot faster because I understood my strengths and weakness and how to get over them”. As with all things new, there was a lot of trial and error in the making of the nine tracks, but he says he learns every day from Fadi Tabbal of Tunefork Studio, where he recorded his album, his Loopstache bandmate Carl Ferneine, as well as the other talented musicians he plays with live. Naffah’s favorite track is “Lilly”, which is about an ex getting married, but it was “Coffee and Cigarettes” that was the first song to get a music video. He enlisted the help of friend and Vine sensation Hassan Julien Chehouri to shoot the “shoestring budget” video entirely on an iPhone in one day. There will be other videos, and while he doesn’t want to get repetitive, Naffah prefers to stick to a similar homemade vibe. “It’s easy to make a music video. You can do it in simple, creative ways without a big budget,” says Naffah, who has a filmmaking degree from ALBA and has worked on various film productions, including most of Loopstache’s videos. Naffah began learning classical guitar at the age of eight and started Loopstache with Ferneine in 2013 at the age of 19. That same year, he played his first concert with The Wanton Bishops at the Wickerpark Music Festival in Batroun, after which he toured with the band around the world for three years. He always wanted to create a solo project, but now that it’s happened he says it feels somewhat lonely having nobody to share the excitement with. The name Alko B is a play on Naffah’s grandmother’s family name as it’s spelled in her Mexican passport, which has turned into somewhat of a joke among his friends. But a solo career doesn’t spell the end of Loopstache – in fact their new album is expected later this year. “I love making music and sharing the stage with Carl [Ferneine]. We’re different, but we complete each other,” he says, while admitting that it’s tough to balance both projects, especially since both acts don’t have a manager. “At some point I’d love to have [a manager]who can help and take over some annoying logistics, but when you first start it’s good to learn how to do [these things]because it teaches you the business, and when you do get a manager you know exactly what their job is,” he says. Like many local musicians, he also finds it necessary to do other work in parallel. “If you’re an artist who doesn’t play covers in bars five days a week it’s very hard to make money from music [in Lebanon],” Naffah laments. After working on film production and other freelance work for a few years, Naffah recently settled down with his first ever day job at art space Plan Bey. “It’s cool, it kind of puts some order in your life. At least you know where you are Monday to Friday,” he says. Naffah, who grew up in Lebanon, says he would move abroad if he is presented with a good opportunity – a sentiment we hear all too often from young Lebanese across various fields. 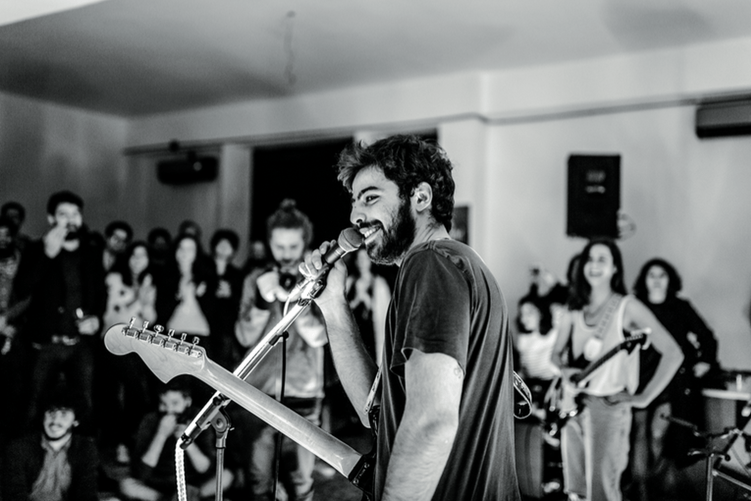 “At the end of the day, I make Western music,” he admits, “It’s nice to know you have a crowd in Beirut, but it’s [not enough to]survive.” But Naffah still has hope for his homeland: “We have amazing musicians in Lebanon. So many people have so much potential. I’m curious to see what’s coming in five years.” Whatever new talents enter Lebanon’s music scene in the future, it’s musicians like Naffah and his peers who are driving local music trends with their genuine, thoughtful and creative melodies, despite few rewards, save the satisfaction of doing what they love.